Growing up on the East Coast, we always looked forward to Spring because it meant freedom from snow (which would be black and dirty by April), and the Passover/Easter holidays, which themselves brought candy, days off from school and special visits with relatives. As far back as I can remember, Macaroons were one of the things I most looked forward to. The Manischewitz brand came in Coconut and Chocolate and later on, Chocolate Chip, and were, in my opinion, the top of the line until I tasted one from a bakery on Long Island called Bruce’s. Like the Wizard of Oz going to color from black and white, my world was rocked when I ate this magnificent morsel, which I instantly awarded the designation of Best Macaroon of All Time. They were shaped like a pregnant traffic cones and were dipped in chocolate. They were crispy on the outside like a coconut hash-brown, but moist on the inside. The chocolate was not too sweet and was perfect complement to the coconut. The chocolate had a sensational mouth-texture to it, requiring a firm bite but rewarding you with melty mouthful. 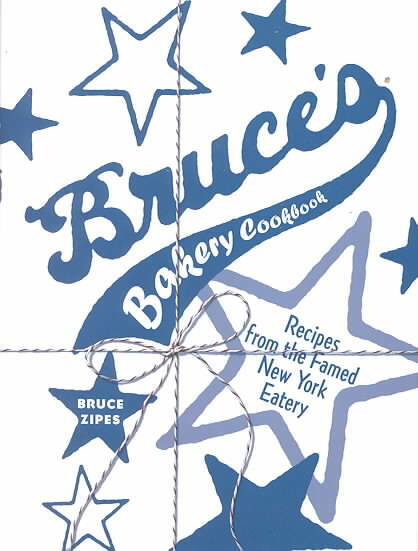 Any pilgrimage to New York always included a trip to Bruce’s to get these incredible treats, and it was always with great woe that I noted they were gone, because it meant 1) I no longer had any of them and 2) I had gained 10 lbs. I tried often to recreate them, but never succeeded. I had mostly given up on trying when I attended a seder and I tasted a macaroon that was just as good, if not better than my beloved Bruce’s. I begged for the recipe, which is here below, and I’m glad I did, because shortly after the next year’s Seder, Bruce’s inexplicably closed its doors. 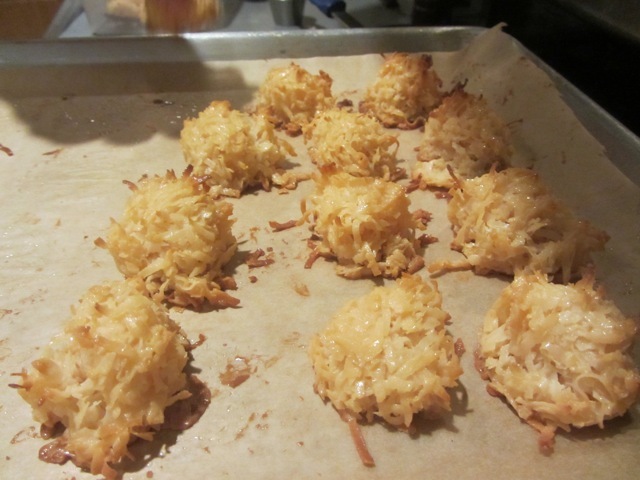 Had I not had this recipe, I’m sure I would have given up all hope of ever eating a chocolate dipped coconut macaroon ever again. The recipe is not complex, but does require ingredients you likely don’t have at home (condensed milk?). Using an ice cream scoop I found was very helpful, but I have yet to recreate the traffic cone shape of the original. Though it is obvious, I must remind you that this is not health food. Some people might assume that if a dessert is flour-free and made with coconut that it could conceivably be healthier or lower in calories than other desserts. But in this case, that is absolutely not true. In fact, this is a true diet-buster, so proceed with caution. Make sure you have a place to bring these, because you don’t want them sitting on your counter, taunting you to eat every last, absolutely delicious one of them. 1. Preheat oven to 325 degrees. Line baking sheets with parchment paper. 2. In a large bowl, mix together all ingredients until thoroughly combined. 3. Press dough into a soup spoon or small ice cream scoop or ball in your palm and place on baking sheet. 4. Bake for 20-30 minutes until lightly brown. Remove from oven; let cool. 5. If possible, submerge (dip) the macaroon in melted chocolate and place on a tray lined with wax paper. (Don’t even start me on tempering the chocolate, that’s a whole other thing). 6. Refrigerate for 20 minutes before serving. Posted in Desserts and tagged caption, Chocolate Chip, chocolate dipped coconut macaroons, coconut desserts, coconut macaroons, desserts, flour-free dessert, holiday treats gluten free desserts, Macaroons, passover treats on March 29, 2015 by Robert Deutsch.